This fix-it guide shows you how to solve Kodi 17.1 buffering issues. Use this guide to erase jittery playback, the “Cache full” message, and other stream playback problems in Kodi. Waiting for a reoccurring “Buffer full” message to disappear from your Fire TV stick is a real pain. This is especially true when you have a taste for 4K or 1080P / HD movies. I recently experienced the “Buffer Full” message on my Fire TV stick. It kept coming back until I put into action my knowledge on Fire TV sticks. 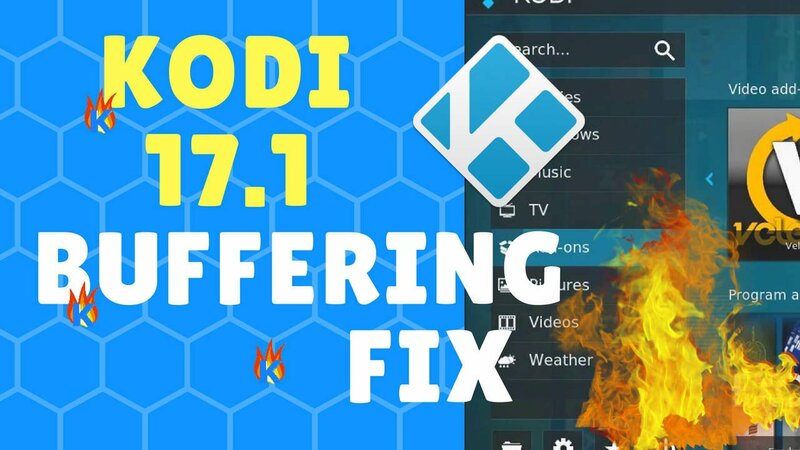 2017 1st Update: Because most TV Addons are no longer working with all versions preceding Kodi 17.1 Krypton, it is crucial that you update Kodi to the new 17.1 version (emphasis .1). Even 17.0 don’t work with most TV Addons again. Updating to Kodi 17.1 is easy. Very Important Security Warning to All Users of Kodi in the United States: the United States Congress repealed the laws guiding issues of internet privacy in the US. To avoid getting DMCA letters, it is important you stay anonymous. You can set unblock and protect your Kodi Streams following our video tutorials on how to configure Kodi VPN and ensure the automatic encryption of your internet data through your VPN service. See also: The movies on Kodi that are available on Claw TV. While Amazon FireTV is one of the few great ways of streaming on the internet, you can also use PC or MacBook also as a Kodi box. As a result of the rising popularity of streaming movies and TV, streams are going away. Basically, sources accessed through Kodi are becoming more and more unreliable. Users of Kodi TV Addons usually assume that the hardware is the cause of the issues. However, the growing number of low-quality streams is the real problem. The increasing number of increasing, popular but unreliable movie links is a problem. This seems likely to be the cause of buffering issues you are facing. Read our Kodi Buffering Guide to get more informed about Kodi 17.1 Buffering issues. Also check out Reddit, and streaming media conference to get more educated on HD Antenna set ups, comparison of streaming services and even devices. Before trying the buffering issue fixes below, try to install a stock Fire TV app like Crackle. This would eliminate the possibility of the stream quality of your TV Addons (Genesis etc.) as the source of the problem. In a simpler way, apps like HBO Go and Crackle because of their size and financial structure usually have more resources. By “resources”, we mean “investment capital” to expend on streaming services and servers. This is in contrast to the minimal capital possessed by the people at Kodi. Though Team Kodi is talented, they have limited server resources. It is critical that you DIVERSIFY YOUR STREAMING APPS! Why? Because a Kodi addon has the tendency to “disappear”. Therefore, you should have more Kodi Streaming Apps that are awesome and cool. So check out our Kodi Best Apps list to get diversified! Ensure a minimum distance of 6 feet between your TV and your Fire TV. Some TVs are known for causing RF interference which can interfere with Wi-Fi’s signal and lead to unnecessary buffering of your Fire TV. Note: Under no circumstances should you use a Quick-Charge cable Your Fire Stick may be damaged when used with a Quick-Charge cable especially those that are more than 2Amps. Other than overloaded servers, another common cause of buffering can be because the devices you are using download the data and stream the process at the same time due to insufficient power. You can resolve this by using devices like the RK3229 Edal which is more powered than the Firestick. By using Navi-X, you can download the video completely before viewing and avoid the Firestick buffering issues. Another possibility is that your internet service provider (ISP) may be throttling your internet connection. You can bypass the throttling of your bandwidth by using a VPN. Users of KFire TV like you will get an exclusive 60% off the coupon if you start using IPVanish and also unblock Kodi (prevent bandwidth throttling and enable TV Addons). More Insight: To throttle the speed of customer’s internet connection, most of the Internet Service Providers have admitted to spying on the Kodi Streaming data. Your ISP will probably spy on your Kodi streaming activities (you can confirm that here or here). This is done to see if you are infringing on somebody’s copyright (something usually mistaken as copyright content). Any suspicion of this will lead to the throttling of your internet speed which can cause unnecessary buffering of your Kodi. You need to use a VPN to avoid this. To hide your streaming activity, you must use a secure service like IPVanish. Using a secure service will ensure your complete anonymity when streaming and guarantee your access to Kodi wherever you are. Comcast, AT&T, Time Warner, Verizon, CenturyLink and Cox. You can try the NFS file sharing instead of “SMB” (windows process) file sharing if you are experiencing buffering issues on your Firestick while playing from a local network location. Alternatively, you can also use “NAS” (Network Attached Storage) drive which links to your network and allows access to your video files by all attached devices (FireStick, etc.). If you have some good knowledge of how to network PCs, you can use software called Wi-Fi analyser to show the least congested channels of your router. You can then set your router to use only routers free from interference. If you are still finding it difficult to use the above process, try and get an iPad Spectrum Analyser/WiPry-Pro that shows Wi-Fi interference when attached to iPad. You can check out this list of 7 Wi-Fi Surveying Tools (Free) to explore the software option. Warning: Be warned that this buffering fix may result in your FireStick stopping playback when the local disk space is full. For Zero cache fix, go Maintenance Tools in the Kodi dashboard and install Zero cache fix. You can also optimize Kodi though the TV/Addons Maintenance tool. Try to fix Kodi buffering through the optimization of your FireStick through the Optimization Guide for TV/Addons. There is a chance that your internet connection cannot handle HD (1080p). If you are unsure, consider trying the SD (720p). if you are of the opinion that it is a bottleneck in your hardware that is causing the buffering, try a new DOCSIS 3.0 cable modem (confirm the one you are buying is compatible with your internet service provider) or gnarly Hi-Power WiFi router. Expert tip: if your internet connection is very fast and have 4K TV, you should be able to stream 4k movies from Amazon and Netflix and also search for them through a 4K TV site. Because the Fire TV is a small device that utilizes enormous power, it will likely get overheated. Get a USB-powered small and portable desktop fan beside it to cool it down. Electronics works better in a cool environment than hot ones. If you are experiencing unending buffering, reinstall Kodi, it might just fix the whole issue up at once. If you are using Kodi and getting Netflix buffering problems continuously, Kodi may be using up much of your device memory. To fix this, go to the bottom of the screen, select power button and then press exit to allow Netflix to have more memory for use. Take a look at the internal space in the bottom left corner. Anything not more than 1GB means you probably need to clear up some space. Select any app that is eating up a big part of the disk space (From 200MB and above) and then choose uninstall. After having a significant portion of the memory space cleared up, the buffering on your Kodi Fire TV should have been fixed. Explore the suggestions below if you are still experiencing the same problem. Try to create an advancedsettingsfile.XML file and then upload it to your Kodi. What you are going to do is put a string of code in the created advancedsettings.Xml file as a further option to fix the Kodi 17.1 Buffering issue. You can read further the guide on how to modify the video cache on Kodi site. Personalizing the playback control option. Tweaking of the video library operation and scanning process. Restoring your device to the default factory settings can sometimes fix software overlapping issues could have occurred in the Android system. The above link is a guide by Amazon on how you can reset Fire TV to default factory settings. You can do a speed test to check whether your network is hampering your connection. A typical 1080p content requires at least a connection of 5 megabits. Use services like SpeedTest to test your internet connection. A 1080p (HD) content, you will need a minimum download stream of 5megabit. Restore your Fire TV to default settings. Most users experience Kodi 17.1 Buffering problems because the network is not fast enough to play the video stream. This is usually caused by so many users connecting to a network stream. Since most Fire TV/Kodi Addons and other apps like Genesis are free, they are all susceptible to overloading since there is no barrier to users. Steps on how to FIX Buffering (A Kodi/Fire TV Youtube video): You will get to understand how to fix Kodi 17.1 Buffering problems. Official guide of Kodi on how to modify Video cache relating to Kodi 17.1 Buffering issues. And finally the guide on How to Optimize FireStick to fix Kodi 17.1 Buffering problems. Are You Still Having Kodi 17.1 Loading Issues? If after all the above professional guides you are still experiencing Kodi 17.1 Buffering guides, then probably Fire TV is not meant for you. Much more powerful devices like gaming devices can provide a better option to address Kodi 17.1 Buffering issues.